A fourth-grade weigh-in then introduced me to vanity. I was never the thinnest kid nor the cutest. Already having been teased for ears that stuck out and weird mom-chosen clothing, I was determined to fit in however possible to avoid future humiliation. Seeing I was the heaviest among my friends, I clung to vanity to keep my gluttony in check so my ability to blend in wasn't compromised. I served these two masters faithfully for many years, vacillating between them hour by hour. One moment something sweet was what I needed, the next I needed to fit into my clothes. I preferred foods that were low calorie so that I could continue my affair with gluttony without the consequences of added weight. I began working out more, not to be strong to serve others, but to pay off the debts I incurred while eating more than I should. It was a Gospel-centered Bible study on 1 Corinthians 10:31 that broke the cycle I had assumed was just a part of life. For the first time the self-centeredness of my eating came into view: I ate whatever I wanted, when I wanted, and I exercised self-control only to keep up the image I wanted. I was eating and drinking to the glory of myself. God desired my eating to be for His glory. Slowly, the Word of God opened my eyes to the many ways I misused food to satisfy soul-longings. The scriptures talked about food as a shadow pointing to God, the One who fills the soul and whose words are sweeter than honey. It was clear that I didn't need food at all; I needed Him. This exposed my real issue: I didn't want God. I wanted slavery to old masters so my tongue could taste the fleeting pleasures of Cheetos and chocolate chip cookies. The Israelites spoke of their past captivity with fondness and God's present provision with disdain. Returning to those cruel, whip-wielding task masters didn't seem too high of a cost to get some meat and onions. Trusting God was too hard. The taste of old food too good. How often do we do the same? Slavery to sin seems worth it if we can indulge in whatever we want. Say to the people, "Consecrate yourselves for tomorrow, and you shall eat meat, for you have wept in the hearing of the Lord, saying, "Who will give us meat to eat? For it was better for us in Egypt." Therefore the Lord will give you meat, and you shall eat. You shall not eat just one day, or two days, or five days, or ten days, or twenty days, but a whole month, until it comes out at your nostrils and becomes loathsome to you, because you have rejected the Lord who is among you and have wept before him saying, "Why did we come out of Egypt?" 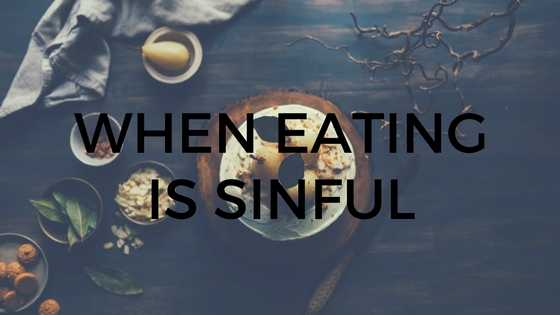 Maybe you've never thought of overeating as a sin before. Maybe it doesn't seem like that big of a deal. But gluttony is the sister sin of drunkenness. Both are too much of a morally neutral thing. Drinking wine is not a sin, but too much wine leads to drunkenness, an overindulgence which persuades our loyalty away from Christ to alcohol. Likewise, too much food leads to gluttony, an overindulgence which persuades our loyalty from Christ to a good meal. Gluttony is just more socially acceptable than drunkenness. But when you lose the ability to say no, you can be assured that you are no longer walking in the Spirit who bears the fruit of self-control. If overeating is not a sin, if it is just a "bad habit" to be reformed, then worldly answers like diets and meal plans are the answer. But if it is a sin, then it is to be grieved and repented of. Like any other sin it is a rejection of God and a preference for something in His place. Fighting the sin of gluttony with a diet is like trying to chop down a tree with a garden hose. The hose has a purpose and is good for some things, but definitely not felling a tree. For that you need an axe. Likewise, to kill sin you need repentance, not meal plans. Repentance is fleeing sin and clinging to God, but it primarily it is the latter. Sin is not expelled until Christ is treasured. That's why there is no better tool to defeat gluttony than a consistent and varied diet of the Word of God. As I see new and familiar facets of God's unbelievable character, my soul is satisfied and food no longer beckons my worship. In fact, it is in the worship of God that we can finally see food for it was meant to be: a shadow of Christ. Finding victory over food-worship (and vanity) begins with the honest admission that we'd rather indulge our senses than know God. We then need an understanding that we cannot defeat sin on our own, that we need a Savior to deliver us. The hunger and thirst driving our gluttony are only satiated in Jesus. Run to Him and believe Him. And when it seems impossible to believe, cry out in desperation, "Help my unbelief!" For more posts in this series, click here.